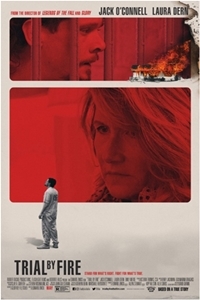 Trial by Fire is the true-life Texas story of the unlikely bond between an imprisoned death row inmate (Jack O'Connell) and a mother of two from Houston (Laura Dern) who, though facing staggering odds, fights mightily for his freedom. Cameron Todd Willingham, a poor, uneducated heavy metal devotee with a violent streak and a criminal record, is convicted of arson-related triple homicide in 1992. During his 12 years on death row, Elizabeth Gilbert, an improbable ally, uncovers questionable methods and illogical conclusions in his case, and battles with the state to expose suppressed evidence that could save him.